Summary of St Norbert: Born in the Rhineland (Germany) about 1080; died at Magdeburg on this day in 1134. A cleric in minor orders, he converted from a comfortable life in 1115, was ordained to the presbyterate, and took up a life of poverty. Founded a community of canons at Prémontré (France), austere in discipline and active in pastoral ministry. Later, as archbishop of Magdeburg, he resisted the alienation of Church property. Noted for his zealous reform of clerical life and for the example of his attachment to the values of the gospel. The image is of a commemorative postage stamp depicting St Norbert, who was the founder of the canons of Prémontré, and an indefatigable campaigner against heresy, schism and corruption in the Church. Patrick Duffy traces St Norbert’s life. Born 1080 at Xanten in Lorraine, France, on the east bank of the Rhine, Norbert belonged to a noble family related to the Emperor, and worked at the Emperor’s court. Although he became a subdeacon and was canon at 30, he lived quite a worldly and pleasure-filled life until a violent thunderstorm led to his conversion. Influenced by the Benedictine monks of Siegburg, he renounced wealth for poverty, and was ordained a priest in 1115. The enthusiasm of Norbert’s reforming spirit did not endear him to the clergy of Xanten, who denounced him. However, he travelled widely as an itinerant preacher and was encouraged in this by Pope Gelasius II (1119-20) who was then in Languedoc. He was soon requested by the Bishop of Cambrai to go and combat heresies in the Low Countries where the sacred species had been stolen and profaned. Because of this, Norbert as a saint has been proclaimed the Apostle of Antwerp, and the feast of his triumph over the sacramentarian heresy is celebrated in the archdiocese of Brussels-Mechelen on 11th July. 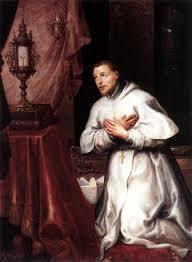 A chance meeting with the young priest Hugh of Fosse, then in the service of Bishop Burchard of Cambray, and appointed to nurse Norbert while convalescing from illness, led to the first foundation of the Norbertine Order in the valley of Prémontré near Laon in Northern France. Here Norbert, Hugh and a few monks lived at first in huts of wood and clay. Within a few months 40 companions joined them and on Christmas Day 1121, they made profession of vows, choosing a very austere regime of according to a rule of St Augustine. This was the beginning of the Canons of Prémontré of which Hugh became the first abbot. 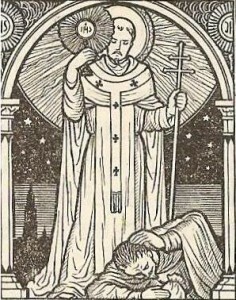 Norbert was in close contact with and was influenced by the Cistercian founder, St Bernard. His own monks had a great influence on the reform of the conventual clergy in France and Germany. He also founded a third order of Norbertines for lay people. In 1126 while he was at the Diet of the Holy Empire at Speyer, Germany, the citizens of Magdeburg disagreed on the election of a new archbishop. In the end they elected Norbert by a unanimous vote. This gave him more influence in the cause of reform in the Church at large. Church property that had been given over to families was restored to the Church. And the example of his monks, some of whom he appointed to posts in the archdiocese, promoted the celibacy of the clergy. With St Bernard, Norbert persuaded the Emperor Lothair II to resist schism in the papacy and to champion the cause of Innocent II as legitimate pope. To this end he joined the emperor in marching to Italy against Pietro di Leone who had installed himself in Rome as an antipope, calling himself Anacletus II. Norbert himself attempted to win Pietro over by persuasion. After these strenuous efforts, he returned to Magdeburg a sick man and died there in 1134. His tomb became famous by the number of miracles performed there. He was canonised by Pope Gregory XIII in 1582. His relics were transferred to the Premonstratensian abbey in Strahov, Bohemia in 1627. The Norbertine Canons had one house in Ireland – the Abbey of the Most Holy Trinity and St Norbert – at Kilnacrott, Ballyjamesduff, Co Cavan.